The Government of Rwanda is identifying a small number of higher level indicators to aid decision-making and record progress. 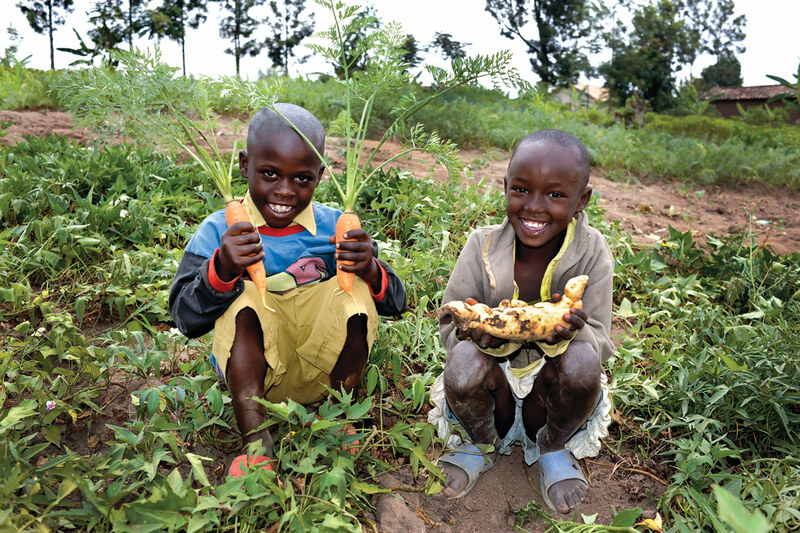 The Government of Rwanda has set itself an ambitious target: to reduce child stunting from 44% to 24.5% by 2018. It has moved food and nutrition to the centre of the country’s development agenda and updated the National Food Security and Nutrition Policy (2013) and the accompanying National Food Security and Nutrition Strategic Plan (2013-2018). Through adoption and endorsement of the policy and strategic plan, the government has committed to ensuring better nutrition and household food security for the nations’ population. Under the previous National Strategy to Eliminate Malnutrition that ran up to 2013, monitoring and evaluation (M&E) mechanisms and reporting systems were established along with coordination mechanisms at national, district and community level. The strategy served as a common framework for action among various stakeholders at all levels. Overall coordination was led by the Ministry of Health through the National Coordination Committee to Eliminate Malnutrition (NCC) supported by the Nutrition Technical Working Group on Nutrition co-chaired by the Ministry of Health together with the United States Agency for International Development, which led coordination of development partners involved in nutrition actions. The updated National Food Security and Nutrition Strategic Plan (2013-2018) has adopted a similar system with strengthened coordination between key ministries and their M&E mechanisms. Interventions have been refocused to the “1000 days programme” for the prevention of stunting focused on children under two years of age. A number of ministries engaged in nutrition – health, agriculture, local government, education, infrastructure and gender – prepare an annual Joint Action Plan to Eliminate Malnutrition (JAPEM) through the NCC. Eachministry submits a quarterly implementation progress report, which is consolidated for submission to the Prime Minister’s Office. Nutrition outcomes and impact are monitored though various tools. In the health sector, key nutrition indicators are monitored through the health management information system and through the community based nutrition programme. Information is collected from district health facilities and through community monitoring tools by community health workers. A more comprehensive survey designed to monitor the health of the population is also conducted every three to five years through the demographic and health survey. 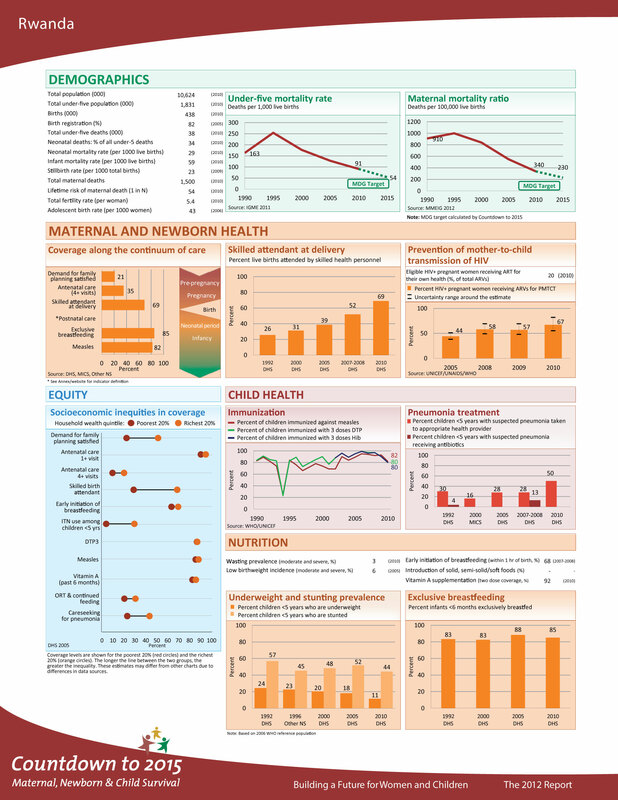 This collects information on fertility, family planning, childhood mortality, nutrition, maternal and child health, domestic violence, malaria, maternal mortality, awareness and behaviour regarding HIV and AIDS, and prevalence of HIV, malaria and anaemia. Food security and vulnerability are monitored through the food security and nutrition monitoring system conducted every six months and the comprehensive food security and vulnerability assessment and nutrition survey conducted every three years. These surveys are conducted by the Ministry of Agriculture in collaboration with the National Institute of Statistics in Rwanda and the World Food Programme and are complemented by the agriculture management information system which collects routine data. These data are disseminated through bulletins and reports provided to all stakeholders for use in decisionmaking, strategy development and programming. District mayors lead the preparation of a District Plan to Eliminate Malnutrition (DPEM), under performance contract with the Office of the Prime Minister. The DPEM is multi-sectoral and includes nutrition-sensitive and nutrition-specific actions related to young child feeding, home fortification, growth monitoring and promotion, screening and treatment of acute malnutrition, nutrition support for HIV and AIDS, social protection, and nutrition integration into agriculture including distribution of one cow per family and kitchen gardens. Programmes are being progressively scaled up with increasing coverage focused on addressing stunting in under twos in line with the national “1000 days campaign”. Implementation of DPEMs is monitored through Devinfo, a system which tracks all major indicators, plans and activities in a highly visual form. Each indicator in the DPEM is depicted in a dynamic manner by presenting the base-line, objectives and frequent updates to show current status in a graphic form. The system allows districts to generate a progress report on a quarterly basis. It draws on data coming from the health management information system and from the community based nutrition programme using health facility records, the system for information on community sanitation (Système d’Information Sanitaire Communautaire SISCOM) and rapid SMS messages from community health workers. Twice a year, the nutrition technical working group conducts supervision missions to monitor the implementation of the DPEM and provide recommendations for improving implementation. Nutrition data are reported from village to cell, health centre and district hospitals on a monthly basis. Aspects that are reported include information on growth monitoring, kitchen gardens, cooking demonstrations, nutrition clubs, child malnutrition, water, sanitation and hygiene, and nutrition education. District hospitals analyse and disseminate the data for their health centres, sectors and communities. Most importantly, the SISCOM database is operational and includes nutrition indicators for every district that help monitor programme performance and allows management to make necessary adjustments as needed. Rwanda’s key intervention to prevent stunting includes a system for effectively and continuously screening children to detect and treat cases of acute malnutrition early. This intervention contributed to Rwanda’s success in decreasing between 2005 and 2010 the prevalence of stunting from 51% to 44%, wasting from 5% to 3% and underweight from 18% to 11% in children under five years1. 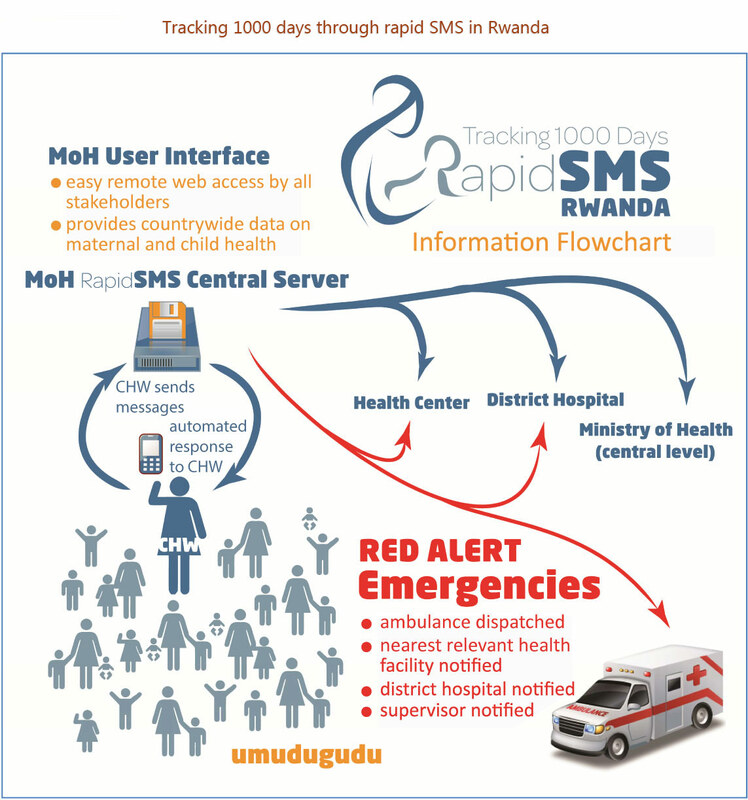 To track malnutrition at its earliest stage, Rwanda uses rapid SMS, a mobile phone-based system designed to continuously track the pregnancy cycle – from pregnancy confirmation until the new-born child is nine months old. The system was expanded in 2013 to track the full 1000 days from pregnancy up to two years of age. This includes post natal and new born care services, tracking childhood killers such as diarrhoea, malaria and pneumonia and communitybased nutrition activities (such as breast feeding, complementary feeding) and the height and weight of children under two years of age. Reported illnesses and community-based management of acute malnutrition cases are followed through for referral and treatment. The system works using real time community based information. Trained community health workers relay their reports to the rapid SMS central server of the Ministry of Health which then generates responses and passes them on to health centres, district hospitals and the central level. In case of an emergency, a red alert response is generated. This enables patients to get immediate live saving services. The effectiveness of the system, however, greatly depends on accurate and constant information flow and generation of appropriate responses. There is a need for quality checks and consistent supervision of community health workers. 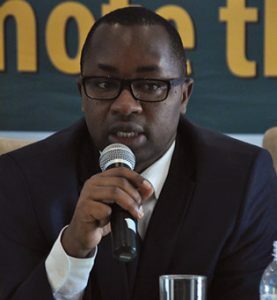 Other limiting factors also need to be addressed such as lack of electricity for phone charging, geographic accessibility for transporting patients, and drop outs or movement amongst community health workers. Despite considerable efforts, fragmentation of information remains an issue as there is no comprehensive national nutrition tracking or surveillance mechanism in place yet. Consequently, information sharing between sectors can be limited. The government is cognizant of these weaknesses and strives to find ways to improve the system. Currently, efforts are underway to set up a nutrition surveillance system with support from the World Health Organisation. Understanding the causes underlying both food insecurity and chronic malnutrition in the country guides planners and decision makers towards tackling food insecurity and malnutrition better. Simple and available technology such as SMS can be used as an effective platform for nutrition information sharing though its effectiveness can be limited by factors that impede constant and accurate information flow and generation of responses. Community health workers play a crucial role for relaying real time and accurate information and therefore require adequate capacity and regular data quality supervision.